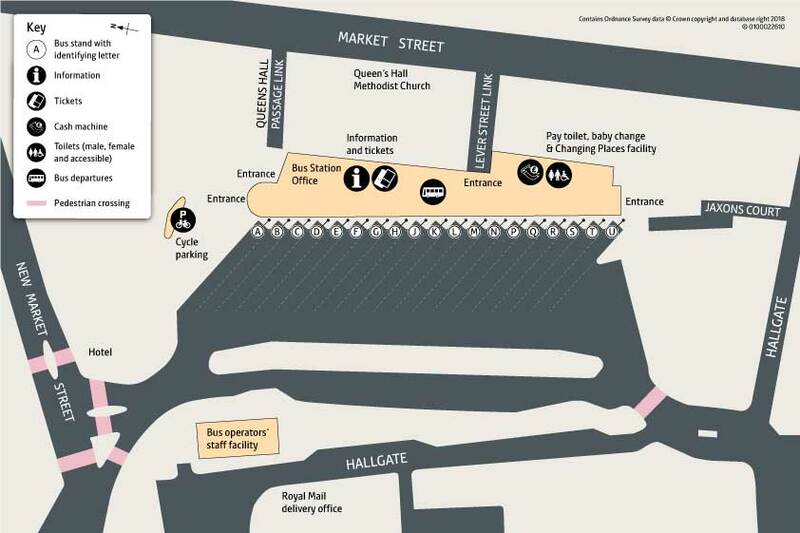 We’ve now completed the redevelopment of Wigan Bus Station on Hallgate. The temporary bus stops on New Market Street, Richmond Street, Dorning Street and the alighting only stop on King Street West have been removed. The stops on Parsons Walk (F) and King Street West (E) remain in use. The new bus station will help people to get to and from their places of work as well as Wigan’s great shops, markets, restaurants and bars in a modern, safe and welcoming environment. Eco-friendly initiatives were a key consideration during the development of Wigan Bus Station. The roof is partly made up of Ethylene Tetra Fluoro Ethylene (ETFE), the same material used in the domes at Cornwall’s Eden Project and for the roofs at Bolton, Rochdale and Altrincham interchanges. ETFE is a lightweight alternative to glass, which lets natural light into the building and reduces the need for artificial lighting. The ETFE sections of the roof are fully recyclable and very durable as it’s unaffected by sunlight, pollution and weathering. Solar panels can also be found on the roof of the bus station and LED lighting within the facility uses less electricity than other types of bulbs. In addition, the central bus circulation island has been filled with wild flower meadow seeds and is beginning to flourish. This provides a habitat for wildlife and attract bees. A cherry tree grove has also been planted. Wigan Bus Station includes important design features for customers with disabilities. Throughout the design and construction of the bus station, we consulted with the Greater Manchester Disability Design Reference Group (DDRG) and the Wigan Access Committee. Their members, who have a wide range of disabilities, provided feedback on the new facility. Combined with customer feedback, this has resulted in a bus station which makes public transport more accessible. For blind and partially sighted customers there is tactile signage and bus stand identifiers, as well as colour contrasting wayfinding lines across the site. In addition to standard accessible National Key Scheme toilets and a baby-changing room, there is a ‘Changing Places’ toilet at the bus station. This is specifically designed with extra space and equipment to meet the needs of people with significant physical disabilities, or profound learning disabilities. Bus station staff have also been trained on best to assist customers who have a range of disabilities.